Library smart RFID management system is based on the emerging NFC tag technology, process integration identity to reader, books, literature, stack room and book rack, set up a more convenient, efficient, fast management and service system between computer information, library collection literature and reader service. System with brand new reader service concept and literature management mode as the guide, with library service work, the actual requirement of literature management and existing problem as the goal, comprehensively to achieve the intelligent and highly efficient of library literature management. 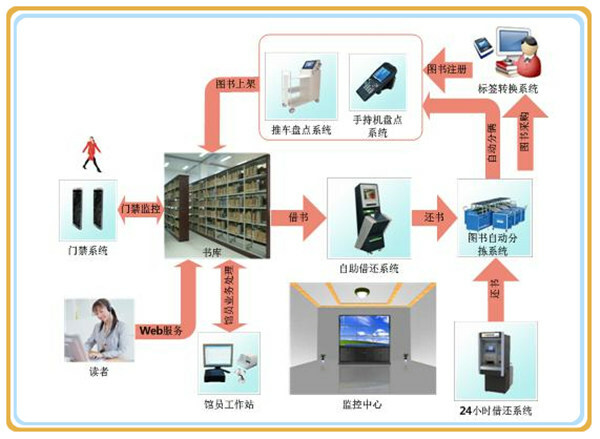 Library smart RFID management system based on advanced RFID technology, fused many RFID equipment, library RFID tags and management software, to provide a complete set of solutions and product for convenient and humanize library management and service. To make the incorporate a library management system for librarians, instead of simple repetitive work, greatly reduced the intensity of labor of library management and circulation service for staff, that manager can be more focus on service. Label switching system provides a registration and management of books and layer tags. Self-help borrow and return system provide self-help borrow book and return book service, to reduce the intensity of labor for staff. Book system also provides a whole day (7 * 24 hours) self-help return service, unattended, to improve the circulation rate of library books. To make the incorporate library management system for librarians, instead of simple repetitive work, greatly reduced the intensity of labor of library management and circulation service for staff. The transportable inventory system provides a quick inventory, clear up bookshelf and other function. Portable inventory system is a sample version of the cart inventory system, portable hand-held set has carried, flexible operation, convenient to collect book information, can read many books at a time, support wireless network collection and other advantages. The safety door system realized barrier free accessibility of entrance guard, safe and reliable, monitor distance can be adjustable, the farthest can reach 2.5 meters, realized the light sound alarm prompt. The book automatic sorting system provides the accurate classification of returned books. The monitor center realized to the monitoring of all the equipment in the library. Monitoring people can eliminate equipment failure in time through the monitor data from active observation center or the alarm information by automatically send from passive monitoring center system, to ensure the service quality and service level of the library. WEB services provide the function to browse information online. Implement self-service, and improve humanized service level. Implement books quickly counted, and improve books resource utilization. Improve books borrowed efficiency of readers, and avoid the phenomenon of queue waiting. Improve the book circulation speed, and maximize the value of books to use. The library management system based on RFID technology has become an effective means to improve the library service level and implement the intelligentsia of the museum collection literature management.